2 Bedrooms, 2 full bathrooms. Also available as a 1BR/1BA. many extra amenities. Akumal is a quaint fishing village where every day is marked by extraordinary beauty and time is measured only by the sun and the tide. Playa Blanca #3 is a ground floor condominium located on Half Moon Bay in Akumal. Sit on your terrace of this beachfront condominium; enjoy the tropical breezes and take in the awe inspiring ocean views. Step-off the terrace directly into the sand where turtles nest and enjoy the spectacular snorkeling that Half Moon Bay provides. This two bedroom, two bathroom condo can sleep up to 6 people. All beds have high quality memory foam mattress toppers. The condos is situated for a great ocean breeze and each bedroom is individually air conditioned for your comfort. Preparing complete meals, or just cocktails and appetizers, is easy in the complete kitchen stocked with high quality dishes and accessories. Other amenities include WiFi, satellite TV, stereo/CD with MP3 inputs, DVD, and a personal safe to secure your valuables. Step off patio into the sand. Separate A/C in each bedroom. CELL PHONE We are happy to provide you the use of our Mexican cellphone during your stay. Included is approximately 25 minutes of local air time. (Calls to the US and Canada are billed at a higher rate but generally considerably less expensive than US/CAN cellphones). Additional minutes can be purchased locally. NO CHARGE FOR INCOMING CALLS making this a great way to stay in touch with those at home! Please ask for more details - small deposit applies. FAbulous location for all the area activities! We loved staying right on half moon bay... we didn’t let the wind or the seaweed pause our activity... highlights were: eating dinner with the locals in the pueblo... cenote xunaan-ha In cheymuil... walking down to the lagoon to snorkel... xel-ha... coba ruins and tulum ruins and beach right next door. We rented a car in tulum and definitely needed it to access the activities surrounding the area. Very enjoyable on a quiet beach road with a quiet, uncrowded beach. The condo is very nice. Very nice condo on an uncrowded beach. The owner and local management were super helpful. Put your guide book away. The owners’ guide tells you every thing you need to know about restaurants and local activities! This condo has a perfect location! Walk out your back door right onto the beach. It has everything you need to be comfortable. 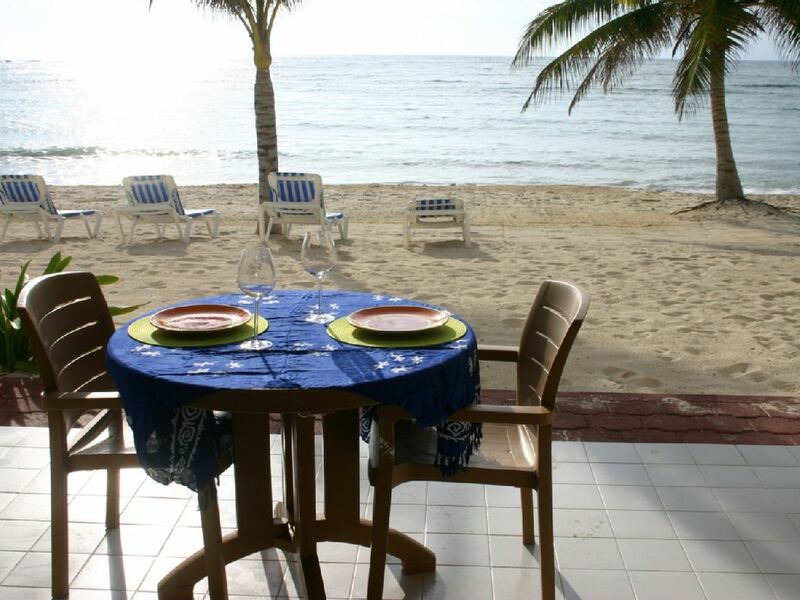 The owners were easy to work with and sent us a packet of information on the Akumal area that was very helpful. Great condo right on the beach! Our family recently stayed at this condo and had a wonderful time! There is nothing like being right on the beach and hearing the waves all day and all night. The owner gave us a huge packet of information with details on restaurants, activities, shopping, etc. and it was very helpful. The weather was perfect, the water temperature perfect, and swimming with the sea turtles at the next bay to the south (Akumal) was a great experience! Thank you for sharing this great vacation spot! Stayed here for 5 nights with my husband and 18-year-old son and had the most relaxing vacation ever. The condo is beautiful, comfortable, clean, and furnished with everything you might need to feel at home (WiFi, a/c, comfy beds, fully equipped kitchen...). But the best part is that the unit is only a few steps from Half Moon Bay. Gorgeous location and much more peaceful than Akumal Bay. When we weren't in the water or exploring nearby cenotes and attractions (recommend renting a car), we were relaxing on the patio and enjoying the ocean breeze. Sandy was easy to work with and provided an incredibly helpful insider's guide to Akumal. Highly recommend this condo. Perfect spot on Half Moon Bay! Lovely condo in the center of Half Moon Bay in North Akumal. Second stay at this great apartment. Beautifully landscaped, friendly and helpful grounds and house keepers. Just a short walk to several convenience shops and restaurants. Close to Yal-ku Lagoon for great snorkeling. Awesome snorkeling just steps off the patio in Half Moon Bay. The turtles were nesting every night. A great base for all the major tourist sites throughout the Yucatan. Quiet, peaceful, beautiful and relaxing. Do yourself a favor and stay here! We are ready to book again! Akumal is an easy one hour drive from Cancun on a modern highway. Great snorkeling and diving right in Akumal. Visit nearby Mayan ruins in Tulum, Chichen Itza, and Coba. The natural water parks of Xcarat and Xel-ha are just a few minutes away. The quoted rates include all costs. Ask about 1 bedroom rate (maximum occupancy 2).